The UP35A is a program controller that features 4 program patterns, 40 segment options per pattern, a multi-channel contact I/O and a ladder sequence function. 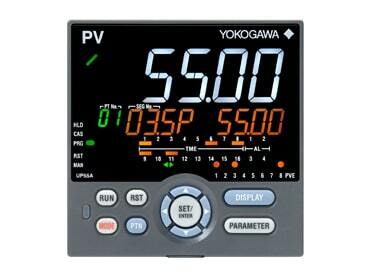 The easy to read, 14-segment large color LCD display and navigation keys greatly increase the monitoring and operating capabilities. The UP35A’s compact design also helps to save instrument panel space. The UP55A is a ¼ DIN sized program controller that provides up to 30 program patterns with simultaneous monitoring of 8 PV events, 16 time events and 8 alarms. It also features a ladder sequence function as a standard option. 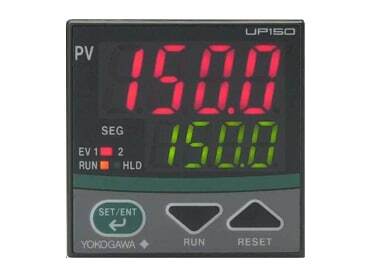 The UP150 is a compact, 1/16 DIN sized program temperature controller that offers one program pattern and 16 segment options per pattern. It also features a universal input, two event outputs, auto-tuning and a “SUPER” overshoot suppress function. 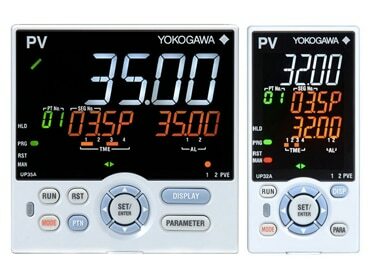 Retransmission output and RS485 communication features are also available as an option.